One landscape business owner has found a unique service in moving large trees. And there was. After some research on the process, Schoenholtz rented the proper equipment and moved the tree to the backyard, where it thrived. Following that success, he realized he was on to something. More than 20 years later, Schoenholtz has moved thousands of trees. It’s become a profitable service for the West Windsor, N.J.-based business owner. 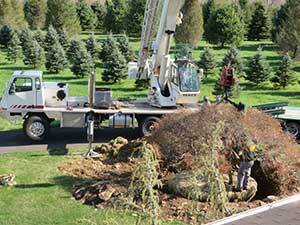 Reaching out to builders and pool companies, Schoenholtz first began promoting his large tree relocation service by letting contractors know they had the option of moving a client’s tree instead of cutting it down. His business grew by word of mouth, and he’s also run some print ads. After five years of renting a tree spade, Schoenholtz had enough work to purchase a tree spade, a commercial truck and accessories—an approximately $330,000 set-up. When the housing market took off, he purchased two more. In his best year of performing the service, Schoenholtz moved more than 300 trees. When the Great Recession hit, business slowed. “When new construction stopped, that really hurt the tree-moving business,” Schoenholtz says. “We were able to ride it out and in 2010 things did start coming back.” Now the company moves about 150 trees a year. Moving a tree with a tree spade typically requires a two-man crew, but the work could require as many as eight men if the tree can’t be transplanted with a tree spade. Pricing tree-moving jobs is complicated, Schoenholtz says. It varies based on how many trees; site conditions; whether the client wants clean-up, grading or rut fixing included; and other factors. It’s taken Schoenholtz a long time to perfect both the pricing and execution of this offering. After all, there’s no training offered or school you can attend to learn this service. Along with his tree-moving service, The Green Scene also has a tree growing operation, so it can supply mature trees to properties that need them. Schoenholtz has been in business for 42 years, both moving and selling trees. 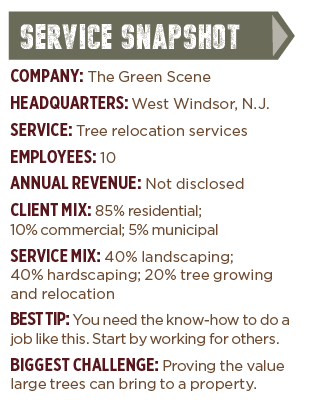 He says the tree relocation business is a bit of an “unusual gig,” but it’s one that he thinks brings value to clients.